Yesterday I attended a local new church start. This was my second Sunday there. God has filled me with a desire to come alongside other pastors and church leaders to help build UP the church. When I say church- I am talking about the universal church-not a denomination. God has told me that I am to encourage, equip and empower ALL of God’s people, not just some or part. I see myself as a “hometown missionary” listening very closely and going to minister where He leads me. Sometimes it is with youth groups and kids and other times with adults and groups. Lately it has been at this little church that sits next to a hayfield on a little dirt road in Carroll County. It wasn’t long ago that God told me that my “field” was right here, right now. I am beginning to see why He said that. There is a sweet, sweet spirit there-it is the spirit of our precious Jesus in the people. I found out yesterday that this group of people started this church many years ago-as a bible study. Over the years it has grown, things have happened and a pastor was being molded. They used to meet in a field and just recently they found this old abandoned church on a farm. They have been there about 6 weeks now-I’ve been there 2. The church is about 200 years old. It has wooden slatted seats, a pulpit, and many hearts that are hungering for God. It is a place to call “home.” Yesterday a little Chihuahua wandered in and sat among us. There is no power, no a/c, no nothing. There is nothing to get in the way of what God is doing there. No traditions, no religious rules, no instruments, no big screens, nothing but you and an anointed woman who is on fire for the Lord, doing exactly what God called her to do- to be JESUS to the people. That’s what I call faith. I have heard two of the best sermons I’ve ever heard in the past two weeks. This little church has MORE than you could ever imagine. It has heart. A HUGE heart. These folks are running after God-ALL of them IN UNITY. When we run in the same direction with the Holy Spirit we get where we need to go- don’t we? That’s the only power we need- is the wonder working power of the Holy Spirit! “ Garment of Praise” ( inspired as I was praying for a family in my congregation last year. This little girl desires to know Jesus. She no longer attends the church. 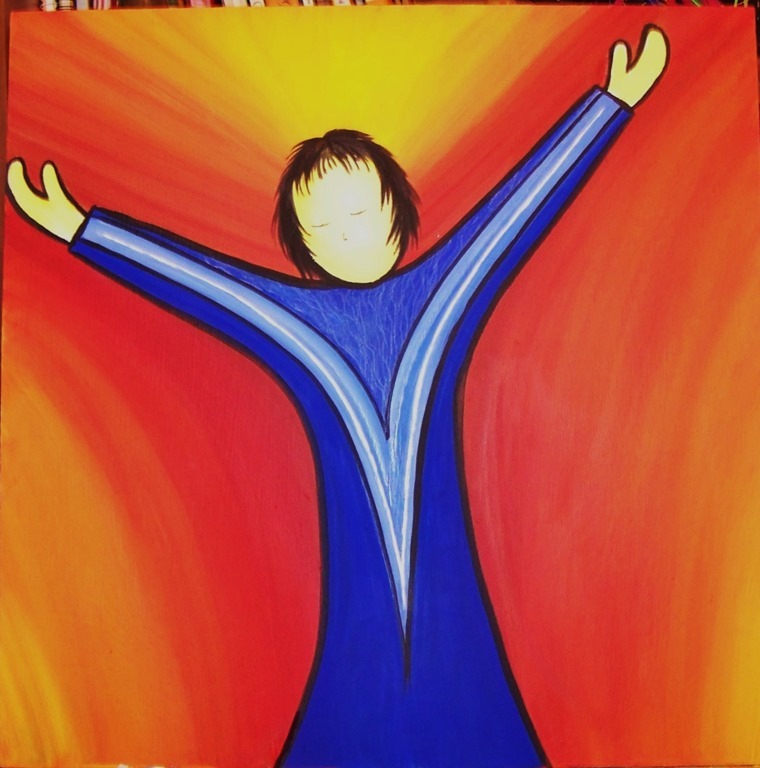 This is my painted declaration over her life-that she SEE’S and knows Jesus and that He IS the VICTORY in her life. This is my way of saying “ I believe.” ) Now this little church is praying for her too. This is a piece I did for the kids at Glenwood. “Love the Lord” the entire scripture is written out. I handed it to the pastor and told her to use this to teach the children. There were more children there yesterday! All of these paintings were inspired by the Holy Spirit as I ministered to the folks at Glenwood UMC and now they are hanging in this little church on a country road in Carroll County. They are a testimony of the GOD who lives and breathes and has HIS WAY with us. Here’s the very best part of this story…. A man in the congregation got up and gave his testimony yesterday. He explained how he could not read well and that his little boy handed him a children’s book with a bible story in it and asked him to read it to him. So he did the best that he could and it was the pictures- the art work –that helped him understand the story. Most men would not have gotten up in church and said anything, let alone that. Listen to me….GOD is AT WORK in EVERY SINGLE THING WE DO. HE WANTS TO KNOW YOU and HE WANTS YOU TO KNOW HIM ….THROUGH A CHILD’S BOOK!!!! A child shall lead them…. I love how GOD WORKS!!!!!!!!!!!!!!!!!!!!!!! Your heart is like a garden. It is the land that God desires to occupy. Whatever you allow into your heart determines it’s fruit. When we plant a physical garden we spend time tending it. We fertilize, we weed, we talk to the plants, we water, wait and watch. God has given us nature so that we might know who HE IS. Because HE IS! There is nothing on the face of this earth that does not have God’s DNA in it. Man has taken what God has made to be good and altered it. Let’s take BACK the land. Let’s take BACK what God has given to us for goodness and blessing. Let’s stand firm in God’s Word and Ways and say, ” NO! You are NOT allowed here. No way, not now, not ever. Get off my property!” I’ve been painting a lot of things with the heart in it. Yeserday I began a painting with a mountain in it shaped like heart. Mountains speak to me of the Father’s heart. They are deep, mysterious and many things lie in the thick of the forest. In order to discover what it is in the forest we must walk a little deeper and look between the leaves of the trees. It is my deepest prayer that the art that I create cause you to peer, to ponder and to press into the Father’s heart. I create because HE compels me to do so. It’s never for me-but for HIM. It is my act of worship to the ONE who IS-the One who REIGNS in my heart. He has started taking back the property in my heart and life and there are no words for the depth of His love that I feel. His love compels me to run faster, run harder and run straight into His heart . It is my prayer that all who read this will take a moment and ask God where He is in their land. Is He a renter or is He THE LANDOWNER?????????????? Take control of your land and cross the waters to freedom! Come…take a journey with me…. The Holy Spirit spoke to me through the words of a friend earlier in the week. I am going to stop there because this brings me to the whole point of this blog, the painting, our lives here on earth and the life of Jesus. He came to do what the Father said and to glorify GOD in all things-even in his death and today in His life! The spirit of truth was speaking to me through my friend and as I read the crucifixion again ( after how many zillions of times…this just PROVES that God never gives up!!!) I began to see as if with new eyes. I have always read this story through eyes of death, pain, and the ugliness of the world. It hurt. 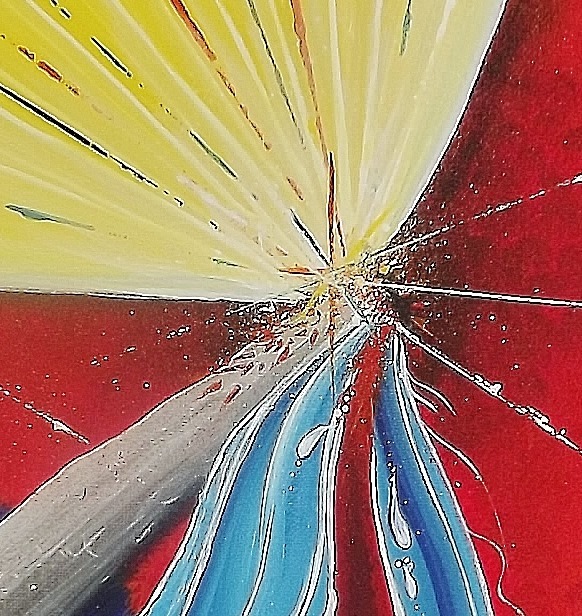 My artwork even showed the pain and in the past year I have shied away from painting it. But this day something changed and I began reading with the future in mind- with the GLORY of GOD in mind. A shift took place in my spirit. So, as I read and I got to John 19:34…. I began to see this whole scene with new eyes and I knew I would paint it. So I began seeing the scene through spiritual eyes and not earthly eyes. We see bodily fluids and blood and searing pain. Remember Jesus was already dead. How often do we overlook this fifth piercing? One in each hand and one in each foot. He had four nail holes-we always think three because there were only 3 nails-but his feet were on top of one another and both received one nail but two piercings. The piercing in his side would make 5 holes. Do you know what the number for grace is? As I sat and read and asked God to reveal Himself to me I began to see glory in places I had not before and the best way to explain these places is to just show you. and in the dying….so that we might live. This is where we go to meet God the Father and the Son through the HS to commune with them in this deep, place in the very center of the Father heart of God. We bow down our own hearts and enter in the narrow way to stand before the Holy One. Holy! Holy! Holy! Is the Lord God Almighty! Who was, and is and is to come! We go there to take a drink of His deep waters. John tells us that Living Waters flow from deep within the heart of anyone who believes in Jesus and we also know that these waters bring healing to the mind, body and soul of man. Thank you Jesus and PRAISE GOD! This is a place of glory. Jesus took the pain to give us the glory and just as He was pierced, so are we-but with a different kind- one of brilliance! A pure and holy love that comes from the Father to live inside of us. It is one that we honor, respect, and revere with our lives. We are called to be holy and pleasing to God in all that we do- a living sacrifice to a living God. That’s the glory- He’s NOT dead as some preach and He’s not angry and He’s not “out to get anyone”-He’s in love with YOU and all He wants is for you to spend time with Him in His dwelling place. His abode. His home. His heart. This is glory revealed. The glory of the Father who gave it all, got it back and and is still chasing us! WOW! Take a listen…and be blessed…His Glory has been revealed! I started to eat this for breakfast and took a picture of it instead. All I see is God’s heart in my fingertips. HS said, ” I am gentle with your heart…” while I was painting. 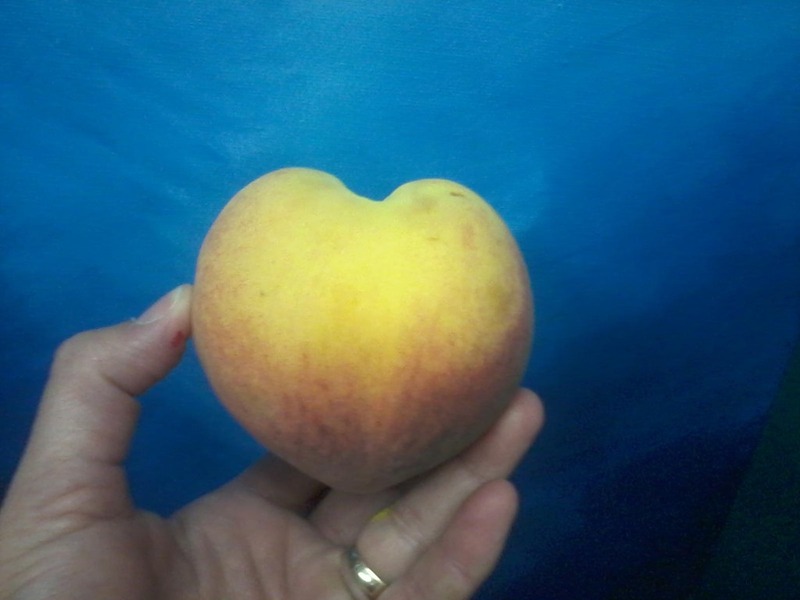 Then I saw the peach and listened to a song by Misty Edwards and I sort of crumpled in the chair because my heart was overwhelmed by it all…. His LOVE is so tender and when we take time to BE with HIM we can experience His love to a greater magnitude. Today has been like a tsunami wave all day long…one endless wave with the ONE endless Father…..
Take time to listen for HIS heartbeat today…. God has been overwhelming me with His love through the colors and shapes of the things that He has given me to paint. He will put an idea in my head and then I start to work on what He has given me and it all sort of morphs into this big piece of art with a message from God. I really cannot explain it with words. All I know is what happens to me while I am listening and creating. It has been a phenomenal journey of faith. Faith with a paintbrush you say? It takes faith. You MUST know who the Father is and WHO HE says you are. It takes faith to spend time in His Word and out of the world’s words. You must eat it, drink it, see it, say it pray it, paint it and live it. Once you do it begins to flow from deep within that well that He placed there for you to draw from. I long to live my life in that abandonment everyday. I’m not there yet, but I am on my way. The more I practice this complete and total act of obedience the more I long for a completion of it in myself and in others. My work here IS to share my journey and to teach others how to live in HIS fullness no matter what their calling is. For me, there is no other way BUT God’s way. NONE. 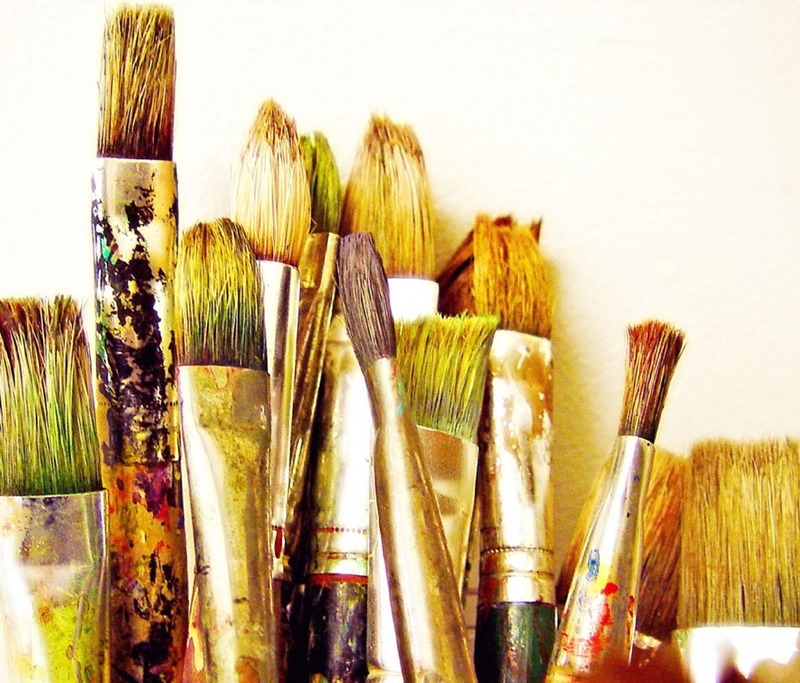 Being a prophetic artist comes with many eye rolls, misunderstandings, and shaking of the heads from the world- “Boy, she’s out there….here comes that crazy art lady again…” and I have had to learn that that’s okay! We ALL must embrace our calling- ALL OF IT. Jesus did it, didn’t He? He didn’t just take the good- He took the WHOLE enchilada! I love, love, love it! I can’t imagine doing anything else especially when someone looks at something you and HS created and they say, “ Hey, I had a vision (or a dream) of that ten years ago” and the whole time they are holding that art piece they are weeping holy tears from God because of what HE IS SAYING TO THEM in the moment. You have no idea what God is stirring inside of them- but you know it is something because what is happening in the moment is tangible and real and thick. You can feel it, hear it and see it in their expression and weeping. Then you hear the story, feel the pain, see the release of JOY and you give GOD the praises for something that only HE CAN DO!!!!!!!!! You see, when we are obedient with abandonment then God can come in and wreck us and others with HIS LOVE. When we stand naked before the KING ( and I mean naked from all the junk we carry with us) then He can have His way with us-ALL of US-not just an arm or a leg, but the whole thing! There is nothing left to tie us down, chain us up or keep us in a cage. It is His love that sets us free, not love from others or things-but HIS total and complete unrestrained love. 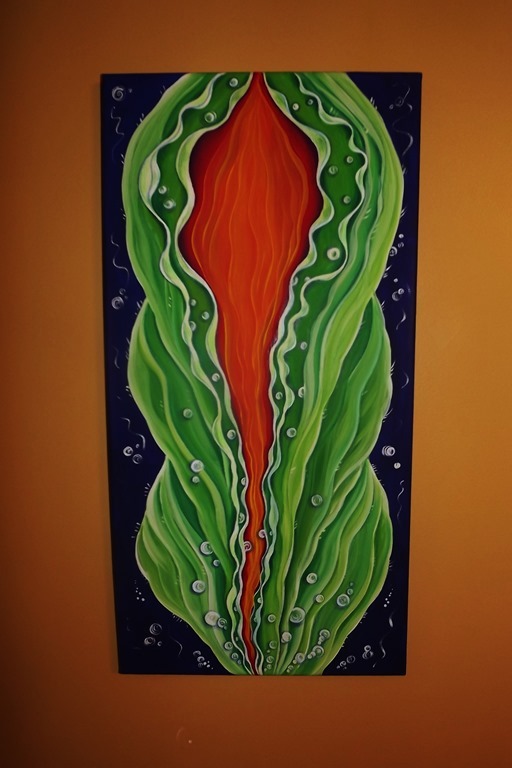 This painting speaks to that unrestrained love. It’s all about “flow-” His ebb and tide. His flow into our hearts and out of our hearts when we come to FAITH in HIM through His most precious Son and Words from the Father. Jesus only did what the Father told him to do. He is our example of total abandonment. A man with no agenda but His Father’s. I want to be like that too. When we allow Papa to come in and clean us up- and that means we have to let go and let God do the work. It’s not up to other people to clean us up, or for us to clean others up-that’s God’s job and that’s why He is GOD and we are not. He’s been busy cleaning me up. So, over the past few weeks I’ve been busy laying self down. It can be hard work and sometimes it takes time for the Father’s work to permeate our souls like a steak in an overnight marinade. It soaks up all the flavors and becomes tender, juicy and oh so delicious. I want to be like that steak and today I am a little more like it. 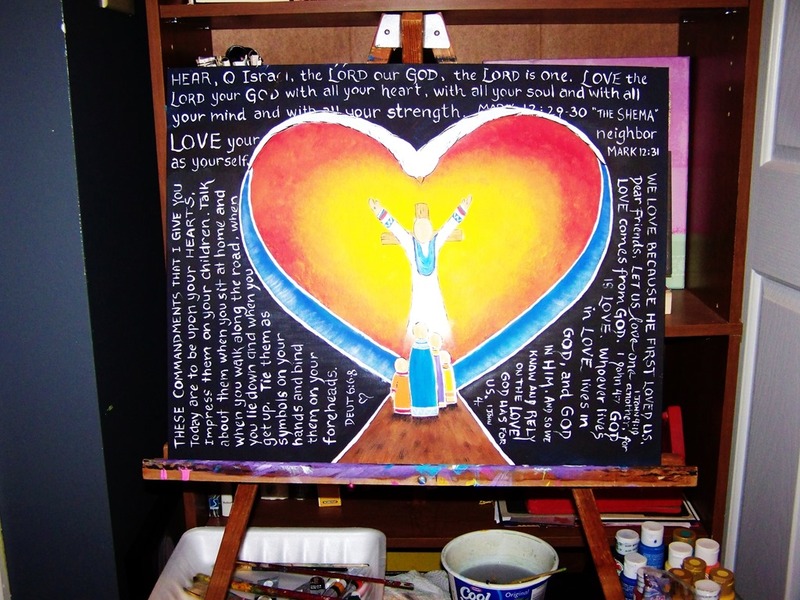 I cannot describe the deliciousness of God that I feel in my heart through words but I can certainly paint it! His blessings overflow when we walk in obedience. So, let me encourage you to take time with “Pops” and ask Him about your life, where He wants you to be, what to do, how to act and especially what parts need cleaning up. God wants to replace our old heart with a new one! One that lives in the flow of His love! Grace and God’s blessings on you as you take IN the Father’s love and release it to others…. Last week I finally met one of my Aldersgate friends in person. She was on her way home from the RADIANCE Aldersgate conference. Ha! She was radiant alright! We had an amazing time of fellowship and prayer. In the few hours that we were together she taught me much about “seeing” God. As an artist I see God in everything, or I always thought I did until I met my new friend. Haha! She spoke to life what I was already seeing and doing in a greater way. Iron sharpens iron and we definitely sharpened swords last week. I thank God for people who are not afraid to share and speak what God has laid on their hearts. She taught me to be free and to fly-something God has been telling me for awhile. All I need is Him. He always brings people alongside of us to affirm His Word in us. Wow! Since our meeting- 6 days ago- a lot of things have taken place. I plan to write a book about my journey one day and this blog is a start. I haven’t been blogging my heart’s cry because I have been keeping my heart guarded and protected. It’s been like Jericho- tightly shut up. The wall fell this week. It’s as if I walked around it 6 times and then on the 7th I raised my voice to God in a cry of prayer and God Himself blew the trumpet of victory!!!! Seven is the number of completion and you know what? I want to be complete in Christ. I long to get rid of all this earthly junk that gets in the way of my relationship with Him. All I want IS to be with HIM. The only way to get there is to rend my heart. Most of you know that I see and hear things in paint. God speaks so clearly to me when I am painting. This is because He is the Creator and I am creating His heart for the world to see and know Him in a visual way. He knows He has captured my heart and He has me right where He wants me-in a blood red, full on, bursting out of the chest relationship with Him. He draws me close as I paint and create. Sometimes it feels crazy and quite frankly I don’t really care what it “feels” like anymore. 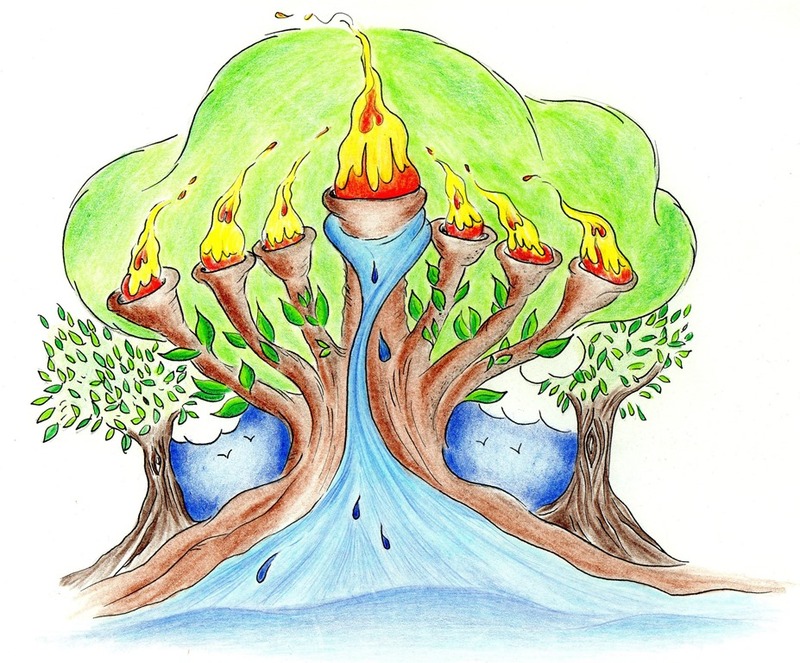 My friend has taught me to “go with the flow…” So, flow Holy Spirit flow…. 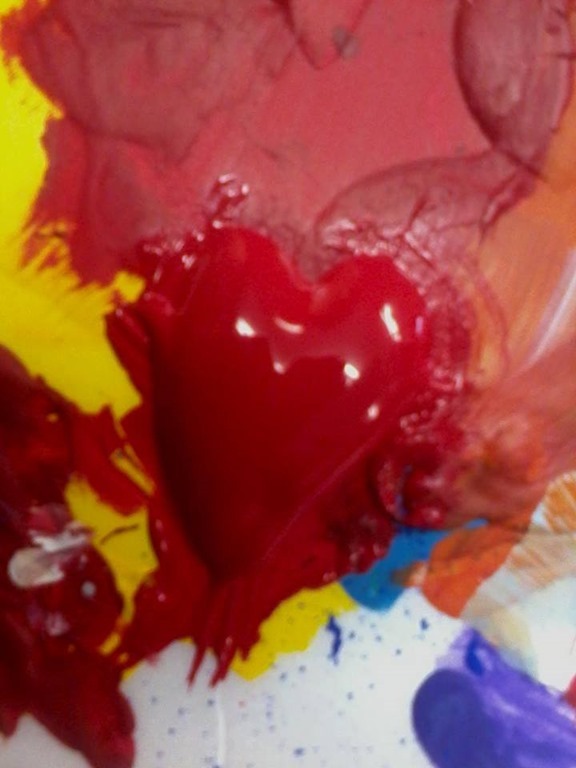 As I painted yesterday I saw this heart in the paint. Both of our daughter’s see hearts in everything and I love how God has given them that creative eye at such a young age. Give them a camera and look out! I shared this picture on FB yesterday and I am always amazed at how God works in the smallest act of obedience. The following paragraph is from a FB post that another friend posted. She is someone I recently met via FB but never in person. We share the same God and that’s all that matters. We sharpen swords together in cyberspace and for this I am thankful. This is how God works. The cutting of the heart hurts but it is oh so worth the pain! Mine has been excised, taken apart, put back, brought closer and stitched back together by His holy thread. When my friend posted this, she had no idea the personal grief I have been suffering. Over my own compromise and separation from God. She had no idea that I had been in a time of holy weeping-giving up what I thought was right for what really IS right-more of Christ and less of me. When we fall to our knees and cry out “Holy, Holy, Holy is the Lord God Almighty” He will show us the way-HIS way. Not ours, not anyone else’s but HIS. The only way to hear what He wants is to BOW down to HIM and repent, receive forgiveness and then WORSHIP the Creator of heaven and earth-the LORD GOD ALMIGHTY! When we try to see things with our eyes it never works-does it? We MUST ask God to give us His eyes for people and situations and when we earnestly seek HIS eyes- He will give them to us and when he does- be ready to drop to your knees and yield to whatever He is telling you. Just do it. He will get you through the fire and to the other side and once you get out you will jump for joy because you are now a little purer than you were going in. What’s in your shopping cart? It should make your face radiant! Think about it! I am forever blessed….thank you Yeshua, thank you Yahweh, thank you JESUS! GLORY TO GOD IN THE HIGHEST!!!!!!!!!!!!!!!!!!!!!! 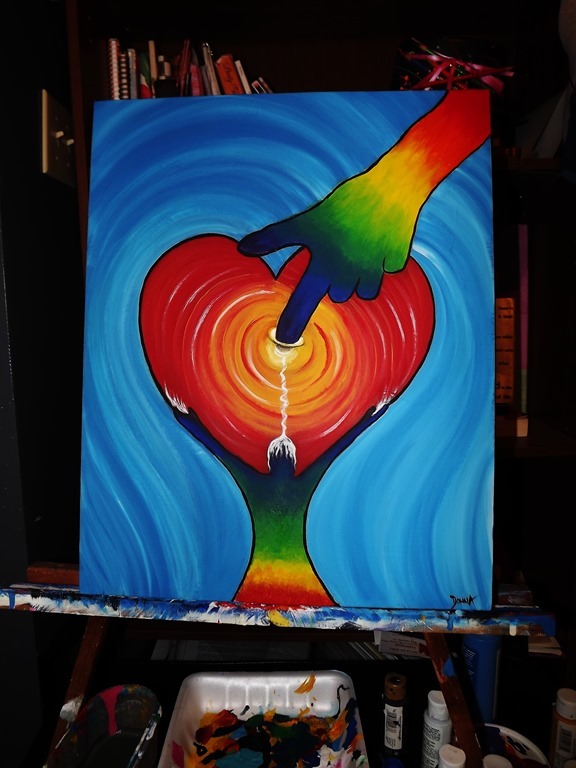 I’ve been painting my heart out lately and as I paint I hear from God. God speaks to us all throughout our day in a variety of ways and when we tune our spiritual ears in we can hear Him. Tuning requires focus, work and prayer. It means picking up that bible, dusting it off and getting into His Word and out of the world’s. Once you know what He says then you can become tuned into what He is saying through your daily journey. I see Him in all sorts of places but especially as I paint. I’m not playing that song anymore. 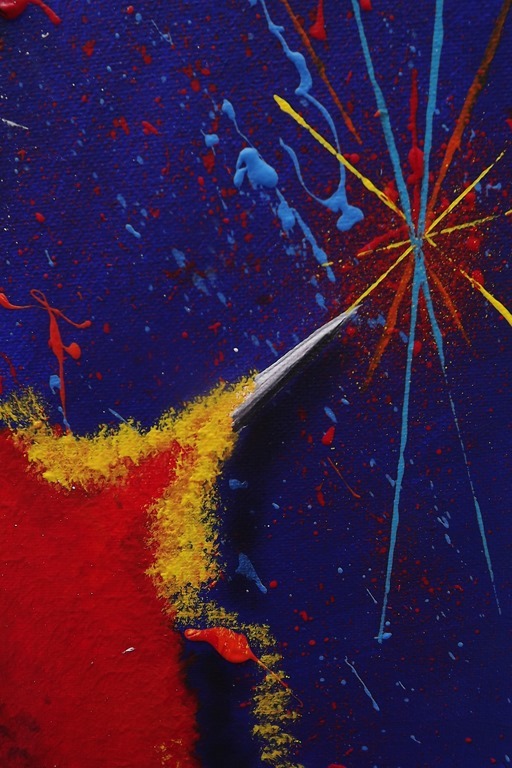 …and this is why I paint…to make the invisible God VISIBLE. If you are an artist and you need some help, encouragement or prayer- message me and I am glad to talk with you, pray with you, and help you in way that I can. I know the doubts that you are hearing BUT I also know the GOD WE SERVE!!!!!!!!!!!!!!!!!!!!!! If you hear Him calling you in the smallest way…say YES! and then take a deep breath and hang on for the ride!!!! You are in for the adventure of a lifetime! Your art is your worship. I pray blessings over your hands, your pens, pencils, paper, brushes, paint, crayons, markers, gluesticks, fabric, clay, whatever your creative medium is-I ask the Lord to BLESS IT!!! To PROSPER IT!!! and to guide your hands and heart in the process! Then I urge you to give it away and watch what happens! God will use your offering in ways that you never imagined possible! He is just waiting to blow your mind for HIS!!!!!!!!!! All Glory to GOD! Amen! So, trust, paint and pray. He IS the MIRACLE MAKER! 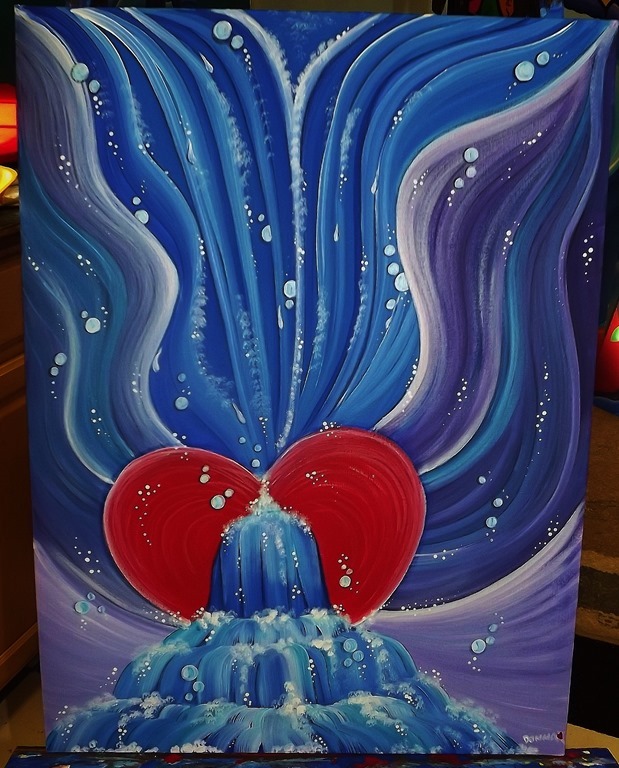 A painting can say a thousand words….this one says TWO- HEALING WATERS. watering the arid valley of acacias. When that day comes we will live in full blown worship to our God and our KING. He is our Victor, our Conqueror, our Healer and our blessed REDEEMER. All GLORY to GOD! It is a joy and an honor to worship our King through His colors. After I posted this I realized it needed music notes in the sky-so I will be adding those tomorrow. Until then- have a blessed evening and sweet dreams and revelations of swimming in His healing waters that teem with life, life and more life. Would you believe this started out as a mountain scene? If you look at it this way it is a mountain scene mirror imaged with a stream running down the middle. A stream of “GLOW”RY!!!!!!!!!!!!!!!!!!!! LOL This was inspired by a motorcycle ride last weekend. We rode through the countryside of West Va. and it was filled with flowing mountains and color! 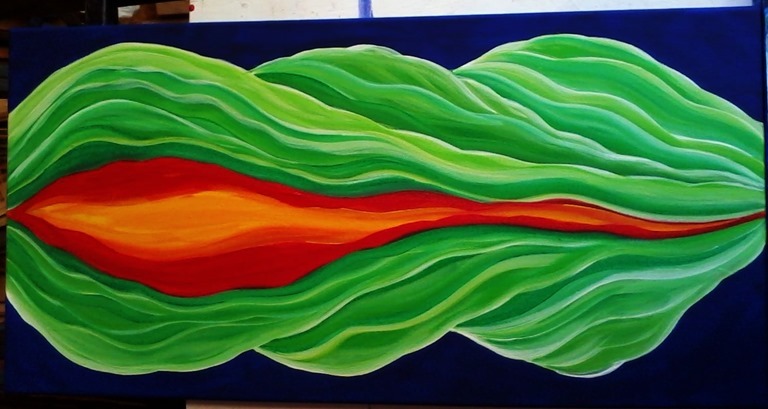 Turned this way it looks like a plant unfurling to reveal it’s inner beauty-much like the heart of Father God. The closer we get to Him, the more he reveals to us-which causes our hearts to open ever wider to His will and way and before we know it- He is busting out! Our lives are not about doing things for God. They are about BEING with GOD. He desires our attention and love. The more time we spend WITH God the more we fall in love with Him and that makes us want to share Him however we can. I’m a simple person, a daughter, sister, wife, mother, friend, artist, and worshipper. Right there are 7 different ways I can share Our Heavenly Father with people. What about you? How can YOU share Him with others? Painting is how I do it. 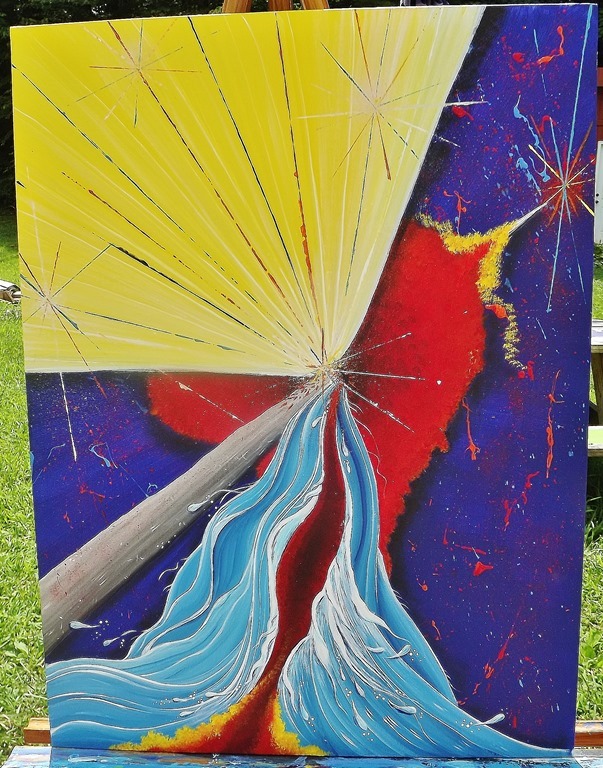 I spent a year preaching and the more I preached the more I wanted to paint. I knew I was in the right place for a season, but my heart’s desire was to paint for My King and teach and share that gift with others. So, that’s what I am doing now. My canvas IS my pulpit. I knew it a long time ago and God has affirmed it. So I am here tonight to just say, use your gift for God. Whatever it is. If you don’t know what it is-I would love to help you discover it. That’s the other thing I love doing- helping people discover where their gifting is and then encourage and equip them to use it. See yourself as the plant and the red and yellow “Glow”ry as your gift. God is just waiting for you to say, “ here I am!” When you do- He will begin to unfurl your colors and you will bloom because He has made you bloom! It’s all for His glory! “ Debbie and I will come back and paint when she gets back from Africa. She MUST see this! 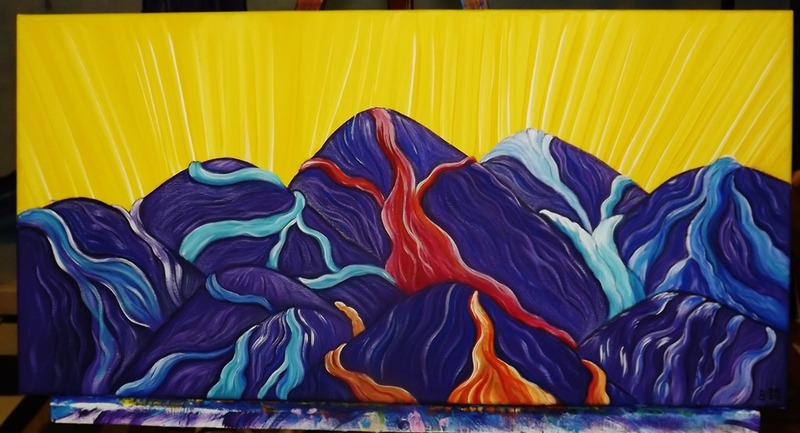 “ She loves to paint mountain scenes and I am really excited to see what she creates while in Africa! We pulled off the road and I was just so taken by the scenery. I felt like I could have just jumped in the grass and rolled down the mountains giggling all the way like Casey Harmon! You know like you did as a kid? It was that smooth looking! I did not have my camera so I didn’t get any good pictures. I took a few with my phone but they didn’t come out so hot. Christ is as God is. God cannot be seen. Christ lived before anything was made. 16 Christ made everything in the heavens and on the earth. He made everything that is seen and things that are not seen. He made all the powers of heaven. Everything was made by Him and for Him. 17 Christ was before all things. All things are held together by Him. I kept thinking about our Creator and how amazing He is to show us Himself in and through nature. I thought of heaven and I can’t wait to see what awaits us there! It was a day of fellowship, thanksgiving, worship and prayer in nature. There is no place I’d rather be than on my bike, with my husband, on an adventure. It fills me up from the inside out with the Spirit of God, like a big fresh breath of air or drink of cool water on a hot day. I can pray, sing and worship as loud as I want with no inhibitions. No one to hear me except God and maybe a deer or a bear. LOL I was not made to be constrained to 4 walls- of this I am sure. He made all things. Nothing was made without Him making it. On our way back to the “hacienda” we were rolling along and some clouds came up. I was watching the sky, just waiting for the bucket to tip and pour all over us, but it didn’t. As I rounded a curve and looked toward the sky there it was behind the trees- Red, Orange, Yellow, Green, Blue, Indigo and Violet- a RAINBOW! I had been lifting up names of people to God in prayer as I rode along and BAM there was His promise right over our heads! I saw one, two and then three rainbows. The third was very faint. I saw the beginning over my left shoulder and the the end ahead of us on the road ahead! I was hooting and hollering and thanking God for His Word in the sky above us!!!!! His colors were over us and that excites me! It is a sign that He is with us, He hears us and He is a God of PROMISE! The MOST HIGH KING! The King of GLORY! The GOD of CREATION! Creator of heaven, earth, life, light and COLOR! It never did rain on us- just ahead of us. Our tires hit the steamy wet pavement and we left our “mark” in the water as we rode back up the mountain. I could see my tire trail in the side mirror. I was singing all the way. God is good to restore our joy when we spend time in worship with Him, but we MUST spend the time with HIM. Thank you Lord, thank you.